Eduardo won a 7-night dive package in Tulamben, Bali at Villa Markisa! The story: This photo was taken in the south of Tenerife open ocean. 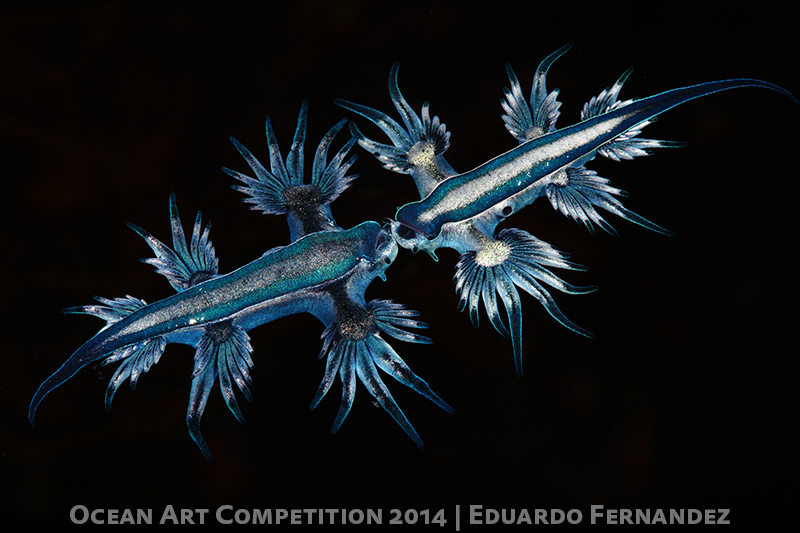 This pelagic nudibranch is about 2 or 3 cm and live on the ocean surface, normally just behind other pelagic organism like venomous Portuguese Man O War (Physalia Physalis), wind sailor Velella Velella or blue button Porpita Porpita. Normally we can found 3 or 4 especies behind the Portugueses man O´War pairing or just fighting because there are a cannibal species. This was difficult to shoot because macro photo taken in the open ocean requires lots of patience and calm seas. Camera: Canon 5D Mark II, Seacam housing, EF 100mm lens, dual Inon Z240 strobes.